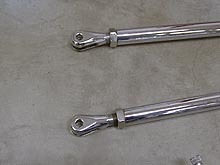 The Magnum 4” dropped axle and So-Cal batwings and radius rods came from Yogi's. 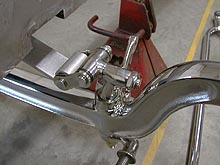 These batwings have the panhard and shock mounts formed right in them for a very clean look. I put a little grease in the ball socket area just for good measure. I'm not sure if this is what the “experts” do, but I figure it can't hurt. I'm hoping this will detour any rust problems in that area. 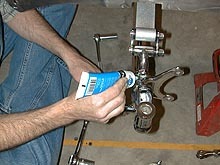 I placed a drop of TriFlo (Teflon/silicon) lube on every bolt. 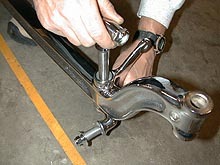 This will assure the bolts will be able to be torqued correctly and not bind on the threads. The shackles were lightly lubed and slid in place, pretty side forward. The front axle is now hanging on the frame. I think the powder painted spring will look nice with the chrome and stainless. I plan on mounting the radius rods to the frame rails instead of using the steel plates that you weld to the bottom of the rail. This will mean that the rear mounting point of the radius rods will be a couple inches higher than “normal” (Figure B). The car should sit a little lower than most, so this will make back some of the difference, but not all. 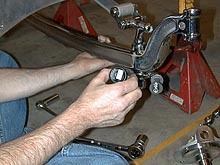 By raising the rear of the radius rods you change the caster, so to compensate I lengthened the lower joints a little. This was done by guessing, so we'll see how close I came later… I guess. This shows you how much we “lengthened” the lower rod. You can see the darker threads that have been exposed.